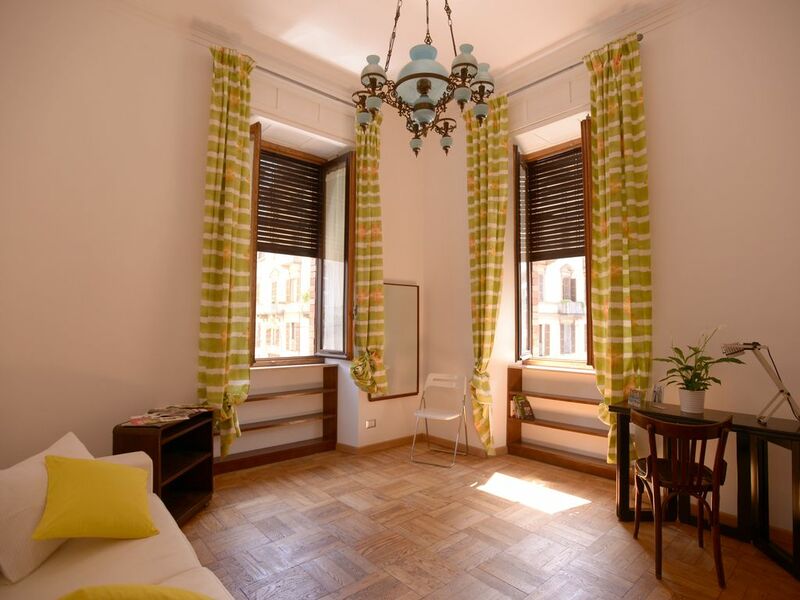 Very bright apartment, recently renovated, located in the heart of the historic district of Vanchiglia, in a house built in 1936. The sisters of the Lescano Trio, swing queens, lived in this house from 1939 to 1945. The avenue gets its name from the presence of numerous artists that in the worked for the RAI in the 50s, which is 8 minutes away by foot. The apartment, on the first floor with a lift, consists of one bedroom and a wide angular living room, eat-in kitchen, bathroom, two balconies and a wide entrance. It can accommodate one to four people, with the possibility of adding a cradle or small bed. The kitchen is fully equipped: dinnerware carefully chosen, cookware suitable for any kind of food, baking sheets, chopping board, microwave oven, and gas oven. The bathroom has a tub, electric water heater and a wide window. The bedroom has a brand new double bed (which can be split into two singles) with slats and orthopaedic mattress; the curtains, produced by the famous fabric shops of Chierese. A closet and side tables complete the room’s furnishings. The living room is wide and extremely bright because it is angular. There is a comfortable and brand new white leather sofa with three seats that turns into a comfortable and large double bed with mesh. The sleeping quality is very important even for a brief stay. And it is because of this that we have chosen high quality mattresses. Bed, bathroom and kitchen linen of excellent quality is provided. The renovation of the apartment was made by experienced and qualified artisans, with attention to the use of materials and processing techniques for the protection of labour and the environment. All the parts of the apartment have been restored to its origins and enhanced, in particular the fixtures. The door window and the windows have double glass and glazing. The apartment measures 64 sq.m and has a ceiling height of 3.70 metres. Due to its particular location, it is never too cold in winter or too hot in summer. The area is well served by public transportation and bicycle paths. The railway station of Porta Nuova is the closest subway stop, at a distance of 2 km. Upon request, we can arrange typical or standard dishes, vegetarian, vegan and pastry. The owner has the necessary permits for food and beverage service. On the outside there are many small supermarkets, the nearest one is exactly opposite to the house in a corner. Banks, laundromats and dry cleaners, bakeries, newsstands, tobacconists, bars, traditional and ethnic restaurants, craftsman workshops, libraries and an excellent and historical pastry shop (del Borgo) are all within a few minutes’ walk. In the opposite direction, always within a few kilometres, you can find the large and romantic Parco di Valentino. Every morning, a market is held in the historical Piazza Santa Giulia. The famous market of Porta Palazzo is a 20-minute walk away. Upon arrival, guests will find a welcome gift. My name is Graziella Silipo, I am 51 years old, and Turin has always been my city. I think I would only switch my current residence for one at the sea, perhaps in Genoa. Turin for me has the perfect dimensions, nothing is too small or too big; I love the river, taking walks in the city centre, looking for books, going to the cinema, and eating chocolate. I grew up in the suburbs, and I know what the industrial city was like! I attended the business school and then the Faculty of Philosophy and Letters. I have lived in the city centre since 1990. My occupation and passion is health, safety and the environment. I believe that people relationships are one of the most important things in life, jointly with the cinema, good wine, good bread, and good reading. I have formed an association called "Voglia di Futuro", which deals with environmental education and food. I attended a cook and pastry school with the Cooks Association of Turin and I have also been a teacher in cooking courses done by the association. We will have a chance to know each other better in person! When I was little and passed by this area, I always told myself "One day I would like to live in this house". And it happened. Actually, I don't live here, but it is my place! It is a particularly active area and avenue, with all the necessities and frequented by many young people. It is home to the studio of the Italian rock band "Subsonica". I thought of sharing my passion for Vanchiglia with the people that desired to visit this place, renting this house because at the moment I don't need to move out of my current house which I have lived in for twenty years. The parking spot is on the avenue. Payment is by the hour, and free on Sunday. There are two balconies, one that overlooks Via Artisti and another one that overlooks Via Vanchiglia. Possibility to book dishes, pastry and complete meals, carefully prepared by the owner, Lady Chef. Graziella and Renato were utterly charming and so helpful. They provided maps, helped with the luggage, called to check on how we were doing. The apartment itself is lovely and well-located, with a grocery store across the street and a tram line right outside. It's near the Po River and centrally located. We found we could walk many of the places we wanted to go. One bedroom does get quite a bit of street noise especially on the Saturday night we were there. But closing the windows and the shutters helped a lot. (And I always travel with earplugs.) Overall, we enjoyed our stay. In fact we extended it by two days! I'm sorry but the noise does not depend on me! The apartment is in the center of the city, in un university district, very popular; there are many clubs and meeting places where youn people love to stay. It's all reported on the annonce in the website. Is not possible to have very very near all the services and the bus and the supermarket and ... all to need and the quite of the country!. Everything near to hand: parking, shops, restaurants and a great wine merchant in the via Giulia di Barolo who sells local wines on draught - and supplies the bottles. Also perfectly situated for visiting the 'must-see' things in Turin - of which there are many. Easy on foot but also easy by car - Turin is the one city in Italy where we drove without concern. A beautiful place for a stay in Turin. Thank you Graziella at Renato for a perfect stay. Thank you! it was a great pleasure to meet nice people nice, enthusiastic and energetic as you. When you want to exercise in the Italian language, I am available! Grazie a voi per aver voluto soggiornare a CasaLescano ed...esserci conosciuti. Persone gentili e cordiali. A presto! Chaleureux accueil dans un cadre idéal pour découvrir et apprécier les trésors de Turin, en famille! Chaleureux accueil dans un cadre idéal pour découvrir et apprécier les trésors de Turin, en famille! Grazie !!! Ho soggiornato con mio marito per due notti in questo appartamento ed è stata un'esperienza molto positiva. Si trova a pochi minuti a piedi dalla Mole Antonelliana e con una gradevole camminata lungo la centralissima Via Po si arriva in Piazza Castello e in Piazza Carignano. L'appartamento che, come ricorda il suo nome, in passato è stato anche dimora delle cantanti del Trio Lescano, è molto curato. Ampia camera da letto, cucina fornita di tutti gli accessori per la colazione e per gli altri pasti della giornata e un grazioso salottino dove ci si può rilassare leggendo sul divano o guardando la tv. Anche il bagno è ben arredato e tutto funziona perfettamente. Molto gradita la gentile accoglienza dei proprietari che ci hanno fornito utili indicazioni per muoverci in città. Se ci capita torneremo sicuramente. Appartamento stupendo e comodissimo sia per i comfort di cui è dotato che per l'ubicazione. Proprietari due persone squisite e gentilissime. Consiglio caldamente questo appartamento a chi vuole fare una vacanza nella sempre splendida ed elegante Torino. Una famiglia bella, simpatica e cordiale. ...meno male che non avete visto tutto quello che avevate in programma così...magari ci sarà occasione e piacere di riincontrarci! Via Artisti is in Borgo Vanchiglia (Borgh Vanchija in Piemontese), one of the historic districts of Torino, located between the northeast border of the old town and the confluence of the Po and Dora Riparia rivers, and belonging to the seventh district. 5 mins walk from Piazza Vittorio and from the porches that, walking by Via Po, arrive to Piazza Castello. On the path (10 minute on foot) you can find the Museo del Cinema, the Mole Antonelliana, the Massimo Cinema (home to the Torino Film Festival), Piazza Carignano and its Theater, the Gobett Theatre, The Museum of the Risorgimento and the Egyptian Museum, the Readers Circle, Via Roma, and many historical palaces and bars. The district is home to the University of Studi di Torino which is one of the main pillars of the artistic creativity and commerce of Turin. At the craft workshops, still present today, you will see an artistic culture of great diversity, with architecture, design, sculpture, painting, theatre, music, and cinema. Piazzetta Santa Giulia, heart of the Borgo Vanchiglia, also used as a market area, home to the church of the same name, built by the philanthropist Marchioness Giulia di Barolo in the mid- nineteenth century. The famous Fetta of Polenta, located in Corso San Maurizio corner of Via Giulia di Barolo, is one of the Turin’s most bizarre palaces. 27 metres high, 27 metre long on Via Giulia di Barolo, 5 metre large on Corso San Maurizio and barely 0.7 metres on the third side. The story tells that it was designed in 1840 by Alessandro Antonelli for a bet. The curious name is derived from the shape of the palace that effectively reminds us of a "fetta" (slice), especially as it is painted with the traditional ochre. The palace of the Bagni Municipali, or Municipal Baths, an eclectic 1905 building in Corso Regina Margherita is located on the Via Vanchiglia. Birago di Vische Palace, In Via Vanchiglia 6, has hosted the Piemontèisa Associassion since 1993, an entity that studies and promotes the traditions and history of Piedmont. In the long Montebello, perfectly round, at number 38, lies a plaque indicating the house, which according to tradition, was the house of Eugenia Barruero. This woman was the inspiration for Edmondo De Amicis’ figure of the young teacher with the red pen in the book Heart. The Largo Rosario Berardi (the beginning of Corso Belgium ) was dedicated to the name of a police inspector murdered by the Red Brigades in March 1978. One of the most famous "vanchigliesi" was certainly Fred Buscaglione, whose house was in the popular Via Bava, at number 26. The Caduta Theatre, inaugurated in 2003 in via Michele Buniva 23, with its 45 seats, it is the smallest active theatre in Turin and among the smallest ones in Europe. Since 2012, the new Einaudi Lungodora University Campus in Siena has been operational. It is located in the former area of Italgas that mainly houses the faculties of Law and Political Science. There is a large wooden statue by Mario Ceroli of the Raging Bull, a symbol of Turin, in the internal courtyard. Arrivi entro tra le ore 12 e le 15; partenze entro le ore 9 del mattino. Il costo è variabile per periodi uguali o superiori alla settimana di soggiorno (ovviamente scontato). Nell'appartamento NON E' CONSENTITO FUMARE! L'appartamento è concesso in uso esclusivo per soggiorni vacanze, studio, lavoro. Il rapporto è regolato da adeguato contratto. Si diffida chiunque a telefonare o scrivere per motivi diversi da questi, per truffe e per attività illecite. Chiunque sia trovato a svolgere attività illecite nell'appartamento sarà messo fuori casa subito, senza nessun rimborso e denunciato alle autorità competenti. The apartment is under exclusive use for stays holidays, study, work. The relationship is regulated by appropriate contract. Everyone is warned to call or write for reasons other than these, for scams and illegal activities. Anyone found to perform illegal activities will be put out of the house immediately, without any refund and reported to the police authorities.